Burning tongue and throat catch the vast majority of sufferers by surprise, and the sensation can be doubly hard to live with if its qualities are unexplored. Some may take heart in knowing that they're not alone - up to 4% of U.S. adults are afflicted with the problem - but real relief resides in the facts. Read on to learn all about what you can expect so that you're prepared if it strikes. The primary symptom of a chronically burning tongue and throat is, of course, uncomfortable physical sensation - but individuals experience the feeling in slightly different ways. Some report the feeling of “burning” in affected areas, like coming into prolonged contact with food that is too hot; others say it's more of a tingling sensitivity; and more still consider it a numbness that won't disappear. Though it is most commonly referred to as “burning tongue”, it can further affect the gums, lips, cheeks, roof of the mouth, and throat, depending on the person. Unfortunately for its sufferers, not enough is known about episodes of burning tongue and throat to predict when they will strike or how long they will last. Some cases may persist for just a few minutes, but others may last hours, days, or even weeks. If spontaneous and unexplained bouts of the condition begin, it's best to see a doctor to verify that nothing more serious is behind the problem. Just as there's little information about the length of its presence, burning tongue and throat is likewise irregular in its severity. Some may experience the sensation only mildly, while sufferers with less luck may find themselves experiencing symptoms in greater intensity. 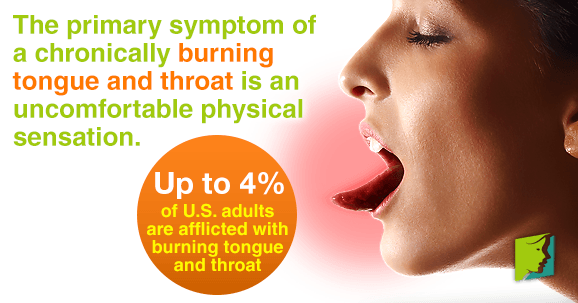 There are several reasons for burning tongue and throat. For women going through the various stages of menopause, the most common culprit for this change is hormonal imbalance, which affects the nervous system and, in part, the taste buds. Other possibilities include badly-fitted dentures, nutritional deficiencies, and the practice of bad habits such as smoking and drinking, which breed bacteria and oral infections. The good news about burning tongue and throat is that simple treatments exist that can offer solutions quickly. Often, lifestyle changes such as eating a balanced diet and getting regular aerobic exercise are enough to reduce symptoms and even make the disorder disappear. When these are not enough, many benefit from trying natural herbal supplements to boost bodily functions, such as ginseng or black cohosh. In severe cases, antidepressants can reduce symptoms medically, but they are best left as a last resort. Whenever unusual sensations appear, the best way to regain peace of mind is to learn all the available facts. Armed with the information above, you can face burning tongue and throat knowing that it's normal and highly treatable. Talk to your doctor today.